Shiraz by Saltram of Barossa Valley. The palate is supported by subtle oak notes and bottle maturation characters. A personal expression of the Barossa's fine Shiraz tradition, Saltram's The Eighth Maker is the embodiment of the proud winemaking heritage established by founder, William Salter, in 1859. The 2001 vintage began with some very warm weather but cooled to allow the fruit to slowly develop good depth of colour and textured tannins. Enjoy with a platter of aged Cheddar, Blue and Brie cheeses with quince paste and lavosh crackers or with aged eye fillet steak witb a roasted field mushroom sauce and parmesan and pepper mashed potatoes. The Barossa Valley is actually a long plain that sits at an average of 230m elevation, with small hills on the western side and the steeper Barossa Hills leading toward the higher Eden Valley on the east. The region includes the towns Nuriootpa, Tanunda, and Angaston. Saltram is situated on Nuriootpa Road just a kilometre from the town of Angaston. The soils of the Barossa are predominantly red brown loams, which are non-cracking, well structured and relatively free draining - making them ideal for growing grapevines. Saltram draws fruit from its own 45 hectare Saltram Vineyard that surrounds the Saltram Winery and Cellar Door as well as from other vineyards throughout the region. These vineyards are spread over from the cooler hills of the Eden Valley to the warmer areas across the valley floor. The Saltram Vineyards yield many different varietals, the vast majority are planted to Shiraz, Merlot and Cabernet Sauvignon, alongside some smaller plantings of non-mainstream varieties such as Malbec, Petit Verdot, Barbera, Nebbiolo and Sangiovese. Peter Lehmann, while winemaker at Saltram, lightened the traditional styles and made distinctive reds, and fine ports. He encouraged the planting of cabernet sauvignon, harvested earlier for better pH control and introduced new oak casks Most of the Saltram vines are irrigated via drip irrigation and supported on a variety of trellising systems with more recent planting on single wire trellising and t-trellising systems. Drip irrigation was developed in the 1950s to allow viticulturalists to grow grapevines in climates with low rainfall. The Barossa Valley receives moderate rainfall of approximately 520mm (mostly falling during the winter months), and has high summer evaporation and low relative humidity. This ideal climate produces relatively low disease pressure, which limits the need for chemicals in the vineyard and also maintains the natural environment. Today, vineyards with a range of climatic conditions use drip irrigation as it allows them more control over the amount of water the vines receive. This extra control allows them to stress the vine by not irrigating at certain times, and irrigating it at others in order to control the crop level and quality of grapes the vine produces. The Saltram Vineyards also have a number of older vines that were planted in the 1950s and 1960s that are dry grown - not irrigated at all. Dry growing the grapes on these vines produces more concentrated flavours and a higher skin to pulp ratio which improves wine colour and tannin levels. In good years, select parcels from theses vines go into the renowned Saltram No.1 Shiraz and various other special blends that make up Saltrams superb range of wines. One of the more recently introduced flagship reds in the Saltram suite is called The Eighth Maker. Created as a tribute to the past seven Chief Winemakers at Saltram, it has established a new benchmark for Barossa Shiraz, creating a classic wine which captures the tradition of the region. Saltrams flagship No. 1 Shiraz is now considered one of the elite Barossa reds, while the Mamre Brook Cabernet Sauvignon and Shiraz continue to win accolades and gold medals. From vintage 2000, winemaker Nigel Dolan took on a more senior role for parent company Beringer Blass as Group Red Winemaker while retaining full control over the style and quality of his beloved Saltram wines. Dolans wines are characterised by a focus on regional and varietal intensity they are made with a firm belief and a deft, masterful touch. 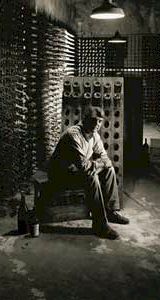 As the creator of the much-loved Pepperjack label, Nigel has established himself as an artful winemaker in the traditional mould, and an innovator interested in utilising cutting-edge winemaking techniques and progressive varietals.